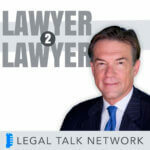 Legal Talk Network is proud to announce that they are relaunching the Lunch Hour Legal Marketing podcast with new hosts Gyi Tsakalakis and Kelly Street. The show, which originally aired in 2015, has been given a makeover and is out with new episodes starting July 2018. Lunch Hour Legal Marketing originally launched in February 2015 as a webinar series for the Massachusetts Law Office Management Assistance Program (Mass LOMAP) to provide lawyers with a range of legal marketing topics, showcased in podcast format on Legal Talk Network. 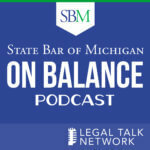 It has since been a series of audio-only episodes called “The Summer of Lunch,” but has now taken a turn into a highly-produced podcast featuring marketing advice for lawyers and other professionals. A non-practicing lawyer, Gyi Tsakalakis founded AttorneySync because he believes that lawyers deserve better from their marketing team. He regularly speaks and writes about online marketing and is a leader in the field of digital marketing for professionals. Kelly Street, Marketing Director at AttorneySync, has over ten years experience in the marketing industry. Kelly also has a self-proclaimed strong passion for helping small businesses grow and is enthusiastic about reaching a much wider audience through podcasting. In the inaugural reboot episode, attorney Mitch Jackson shared fantastic insights on identifying your “whys,” newsjacking, and other digital marketing strategies. In the coming months, Lunch Hour Legal Marketing will feature guests such as Chad Burton from CuroLegal, a legal industry consulting and design organization, and Lost and Founder author Rand Fishkin formerly of Moz and founder of SparkToro, one of the most prominent digital marketing companies, discussing marketing tactics on all levels. The show aims to bring varied content targeted towards lawyers, but can be used by those in other professional fields as well. Anyone looking for advice on client development, networking, and digital marketing will find Lunch Hour Legal Marketing to be beneficial to their practice. To listen to the new episodes, go to the Lunch Hour Legal Marketing show page, subscribe on Apple Podcasts and Google Play, or download the Legal Talk Network app.